The Yorkshire Dales is Lupine’s local playground for all manner of outdoor activities with many of our staff truly “Yorkshire born and bred” having an intimate knowledge, and obsessive love for, this exquisite area. Some might say it’s “God’s Own Country”, and who dare contradict them? For those wishing to raise money for charity or just push themselves among beautiful surroundings, Lupine can support a range of walking challenge events. Lupine supports the Friends of the Three Peaks to protect and enhance this inspirational landscape. For those keen to avoid the crowds, there’s the alternative, 22 mile, Wharfedale 3 Peaks Challenge of Birks Fell, Buckden Pike and Great Whernside centred on Kettlewell. We’ve also developed our own, 23 mile, Caves, Waterfalls, Tarns and Mines circuit using picturesque and vibrant Settle as a start point and base for your celebrations. Please speak to us about bespoke ideas for your own Yorkshire Dales challenges. 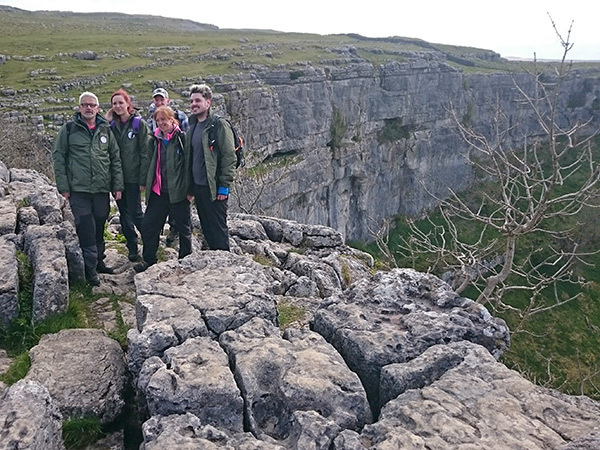 For children, Pen-y-Ghent or Malham Landscape Trail (perhaps with an ascent of Gordale Scar) and sections of the Dales Way make good sponsored walk routes. Contact us with your fund-raising plans. Walks can be developed in order to explore elements of the school curriculum or meet personal development objectives. If you’re a Bradford School, talk to us about the Bradford Opportunity Area scheme. Support for GCSE PE rock climbing and other work with schools. If you’re a Bradford School, talk to us about the Bradford Opportunity Area scheme. 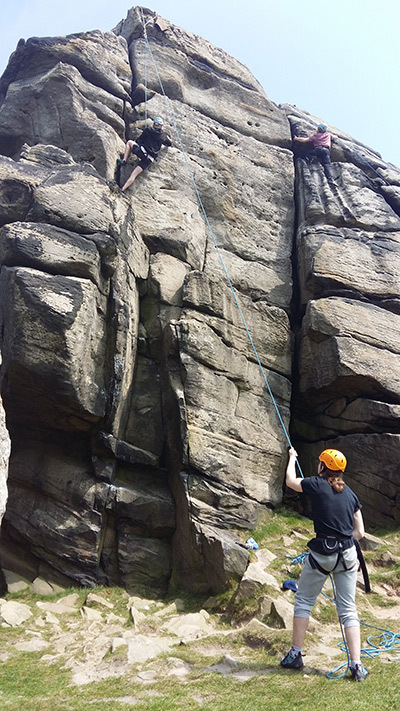 Speak to us about your Yorkshire rock climbing plans. With our wealth of local knowledge we can add value to your day or long distance walk. Explore the limestone landscapes around the southern Dales with our “Three Peaks Up and Under” walks. These follow Simon Oldfield’s itineraries, locating ancient settlements, potholes and other natural and cultural history curiosities, from his book, A three peaks up and under. Let us guide you on Malham’s Landscape Trail. Ideal for groups preparing to study Geography or geology GCSE – limestone landscapes, faulting and glacial processes. Or anyone else interested in this unique and spectacular place. We can guide sections of these walks, taking care of the navigation and other logistics, leaving you free to enjoy the journey. 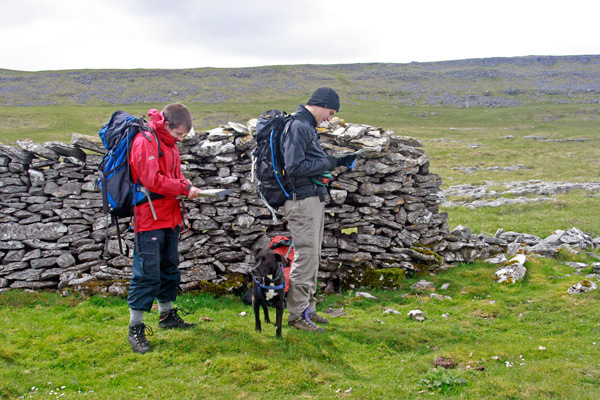 Our navigation courses and Mountain Training Hill Skills courses can all be run in the Yorkshire Dales for your local convenience or to enjoy these special landscapes. "I've been using a map in the mountains for years, but never knew i could do it with such accuracy as i did with Lupine. I'll be far better a navigator and far safer in the mountains in the future"
"What a great day! I'd done ghyll scrambling as a teenager, but that was years ago, and I was slightly worried about how I would get on - there was no need. I had so much fun and Ben, the instructor, was really encouraging. At one point, on seeing the wall of rock I had to get up my initial reaction was 'er, I think I'll skip this bit', but he talked me through it and I ended up surprising myself and managing it. A brilliant day out and we even got a nice walk afterwards, with beautiful views and a fair bit of local information. Can't wait for the next time!"